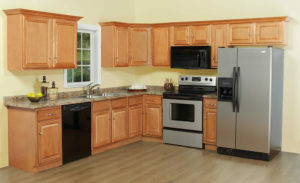 Cabinet refacing can save up to 50 percent compared to the cost of replacing,” says Cheryl Catalano, owner of Kitchen Solvers, a cabinet refacing franchise in Napierville, Illinois. Even with the potential cost-savings, however, refacing isn’t right for every kitchen remodel. Before making the decision to reface homeowners need to consider a number of factors, starting with the “bones” of their current kitchen cabinets. “If they are not high-quality cabinets to begin with, it usually makes more sense to replace the entire piece,” says Deborah Ramos, an interior designer in St. Petersburg, Florida. There are two parts to most cabinet refacing jobs. 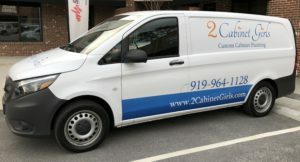 You’re probably familiar with cars or trucks that get wrapped in some type of branded or advertising type of covering. Cabinet resurfacing is sort of like that. 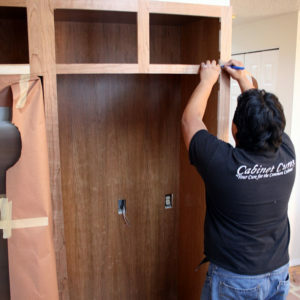 A company like Cabinet Cures will “wrap” your bases with a brand new veneer that will make your cabinets boxes look brand new. They will also give you brand new doors and drawers. These new pieces can be stained or painted without all the construction associated with tearing out your old cabinets and installing new ones. According to House Logic, a professional cabinet refacing for a 10-foot-by-12-foot kitchen starts at around $1,000 to $3,000 for laminate. Expect to pay $2,500 to $6,000 for wood veneer. Costs can rise to $7,000 to $9,000+ for larger projects with high-quality wood veneer. When your kitchen cabinets or bathroom cabinets are in good shape but you would like to change the color is when painting your cabinets makes the most sense. Maybe your home was built when dark cabinets were all the rage and now your kitchen or bath seems too dark. Maybe your builder gave you boring white cabinets and you’d like a splash of color. 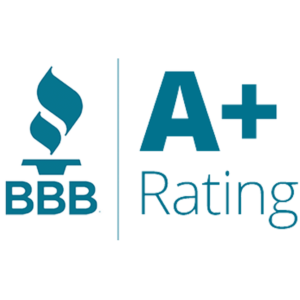 Maybe your cabinets and floor are so closely matched that it all runs together. Any of those situations are where painting your kitchen cabinets makes sense and saves you even more money. What exactly is cabinet painting? It’s exactly what it sounds like, we come in and paint your cabinets. We paint the bases (the parts that are screwed into the walls and floors) by hand and take the cabinet doors and cabinet drawers back to our shop to spray them in our paint booth. The process takes a week and you never really lose the use of your kitchen. If you have a modest kitchen, like the one pictured on the right, the cost would be about $1,900. You can find out how much it would cost for your kitchen by counting up all the doors and drawers and entering that into our kitchen cabinet cost estimator (which doesn’t require your email or phone number or any additional information) and you’ll get an instant ballpark estimate.